Photo by Rasu Jilani. L-R: Grace Anieza Ali, Jamilah Lemieux, Baba Israel, Niegel Smith, Allen Kwabena Frimpong, Beatrice Anderson. 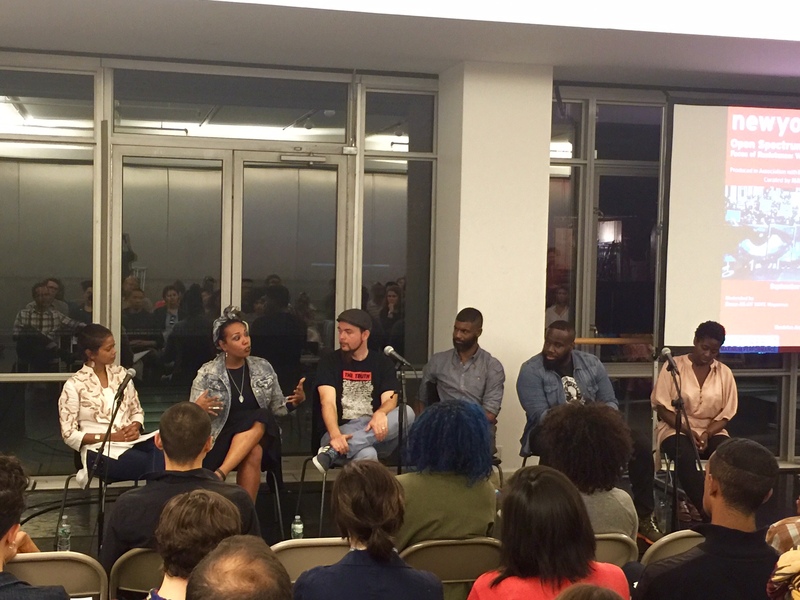 The evening of Monday, Sepetember 28th, moderator Grace Anieza Ali asked panelists at New York Live Art’s first Open Spectrum Critical Community Dialogue of the season: What is your art? What is your activism? It was my honor to be present for the conversation that ensued, during which the assembled participants shared mindful, thoughtful, radical, joyful, and challenging practices of Being In Action. Moderated by Ali and curated by Rasu Jilani, MAPP International Productions’ Director of Community Programs (whose thoughtful commentary on the impetus for this conversation series can be found here), the event brought together Jamilah Lemieux, Baba Israel, Niegel Smith, Allen Kwabena Frimpong, and Beatrice Anderson to discuss their practices of contemporary movement-building. The discussion covered themes of legacy and context, self-care, the intersection of the personal and the political, and co-creation as a narrative asset. What made this a really radical convening, however, was that critical practices around these ideas were shared not just in the words of the participants, but in the way energy of the room was shaped by their comportment and engagement. I’ll recount a few illustrative moments. In response to Ali’s opening questions – What is your art? What is your activism? – Allen Frimpong sang a song by Black Panther Party artist and activist Elaine Brown. By joining his voice with that of a mentor/elder/path-maker, Frimpong asked the room to listen differently. Broadening the modus operandi of Panel Discussion to include an element of activist performance, we tuned our ears to the frequencies of transformation and liberation that have been vibrating in the work performed by activists across generations. He contextualized his reasons for singing, and singing that particular song, explaining that his practice is to make visible the invisible connections we have to the history of our movements. When, later, he discussed how, as an organizer for Black Lives Matter, he mentors and coaches other activists and organizers, you understood the richness and depth of meaning mentorship can have as a means of honoring legacy and history while working for change in the present. When asked about skepticism around social media-based activism, writer and senior editor for Ebony.com Jamilah Lemieux pointed to the language-based change she has witnessed on Twitter as evidence of a new paradigm in cultural consciousness. Speaking specifically about her observations of the shift in language used around gender by black, cisgender, heterosexual men, she made the point that a platform like Twitter allows users to encounter and employ new concepts through language, gaining access to new ways of constructing identities and practicing those identities through words, making manifest social change. Then when the discussion turned to self-care, Lemieux connected language-based change to personal practices as well, citing her evolving relationship to the words “I can, I want, I need” as an important framework both for staying healthy and accountable, and for resisting exploitative racist and sexist expectations on the labor of black women. Beatrice Anderson, healer with Harriet’s Apothecary and director of Awake Youth, identified her art practice as meditation, which she described as a reminder that I have space and I take space. She activated this practice through her physical and vocal presence in the room, as well as in the way she facilitated space within the conversation. When self-care came up – how were the panelists succeeding or failing at taking care of themselves? – Anderson was not asked for her perspective on the matter. She pointed out this omission later on, and in redirecting attention back to that topic, she expanded the idea of self-care, bringing up the questions: who heals the healers? How do you protect yourself when your Self is necessarily present in the work you do? How can you co-create a movement or a project while manifesting your own care and intentionality? Niegel Smith, director of the Flea Theater and ring leader of Willing Participant, offered that in his work, he creates spaces for contemplation, consideration and collaboration by approaching every decision as a creative decision: how do we use our bodies and our texts to make our every day an active response to the present moment? In the course of the evening, the curator, panelists and moderator co-created a space for practicing this mode of active response, both quotidian and extraordinary, inviting the attendees to be included the work they do. This was evident when Ali asked the room to take a moment to honor the labor of the artists and activists convened. It was evident when Frimpong and Anderson recollected transformative moments of joy borne of struggle, naming those moments of joy as truly radical. It was evident when, near the end of the event, hip-hop activist and theater artist (and the only white person on the panel) Baba Israel took a moment to acknowledge his whiteness, and the privilege therein. I appreciated that he waited until the end of the conversation to bring up his whiteness; in so doing, the conversation unfolded without asking for his privilege to be admonished, apologized for or accepted. Instead, his gesture had an air of uncertainty: he knew he needed to bring it up, he knows he needs to negotiate his own whiteness in the context of his work to unseat white supremacy (or “unfuck” things, as he put it in a participatory poem he shared). In a non-prescriptive way, he sincerely made space to be held accountable, and to locate himself in the matrix of power undergirding social change. In keeping with Israel’s impulse, I want to situate myself and what I have to offer to this enterprise. I am a critical thinker, performance maker, and cultural convener, newly added to the Culturebot leadership band to attend to live programs and outreach. I am a white, cisgender, queer person with class privilege, and I consider myself to be an artist and an activist (although I find both of those mantles difficult to occupy, at times). My work in these Critical Community Dialogues is to listen and consider with my fullest capacity, and to support the paradigmatic shifts in thinking, being and doing this project seeks to engender. I hope that others who were present, or any for whom these Critical Community Dialogues resonate, will also offer responses; and though the studio at New York Live Arts (219 W 19th St., NYC) was almost full last Monday night, I hope even more folks will join us for the next one. Eva Peskin makes performance as a member of ANIMALS Performance Group and at large around NYC, having collaborated with numerous artists as a performer, technologist, musician and rigorous conceptualizer. She serves up programming and outreach for Culturebot.org and teaches critical media literacy with The LAMP. Upcoming: 2015/16 Queer Arts Mentorship Fellow for Queer Coup! How to Surive in the Woods, an inter-generational queer scout troop/performance troupe.